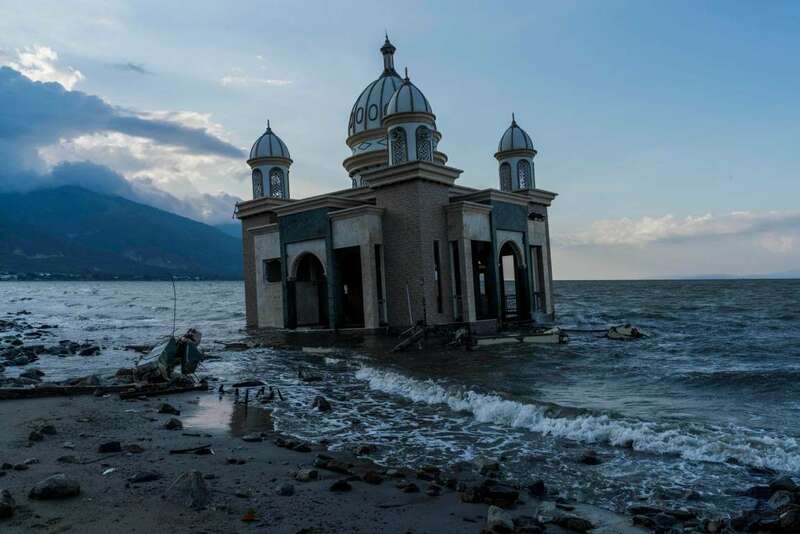 A section of a mosque was swept into the sea in Palu. 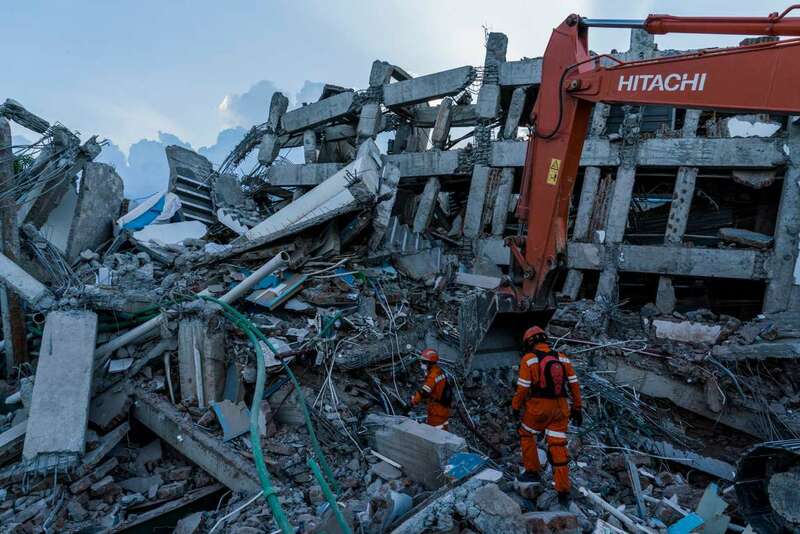 When rescuers first arrived at the Roa Roa Hotel in central Palu, they could still hear the voices of guests trapped inside, calling out for help, after an earthquake caused the eight-story concrete structure to collapse. But that was days ago. Now, in much of the battered city and surrounding areas, there is only silence. 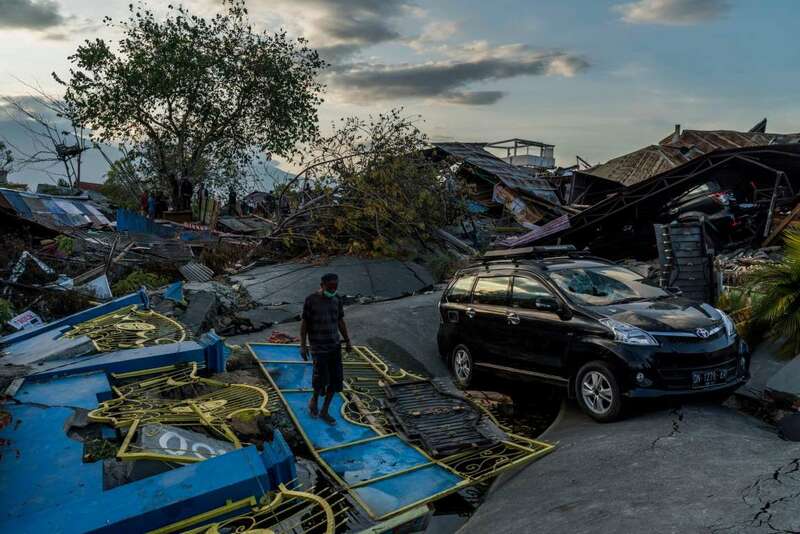 It has been a week since a 7.5-magnitude earthquake and a 20-foot tsunami devastated the Indonesian island of Sulawesi, killing more than 1,400 people in Palu and its vicinity. 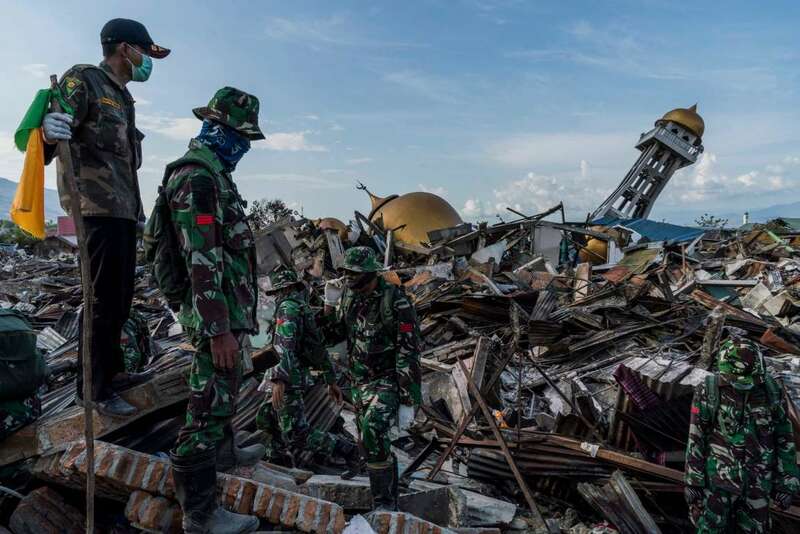 By Sunday night, Indonesian search and rescue teams at the Roa Roa Hotel were already describing the eerie quiet that had fallen over the rubble. On Thursday, as rescuers dug their way through the city’s most devastated neighborhoods, there were no urgent calls for aid. It had been days since most rescuers heard a cry for help. Women carried belongings from their home through the heavily damaged Balaroa neighborhood. There was what appeared to be a small glimmer of hope late Thursday night, when the French organization Pompiers de l’urgence, which has been taking part in rescue and recovery efforts, said that its high-tech sensors had “detected the presence of a victim” inside the collapsed four-star Mercure Hotel in Palu, according to The Associated Press. But hours later, the group could not confirm whether a survivor had been found. In the neighborhoods with the worst destruction, there may never have been any cries for help. 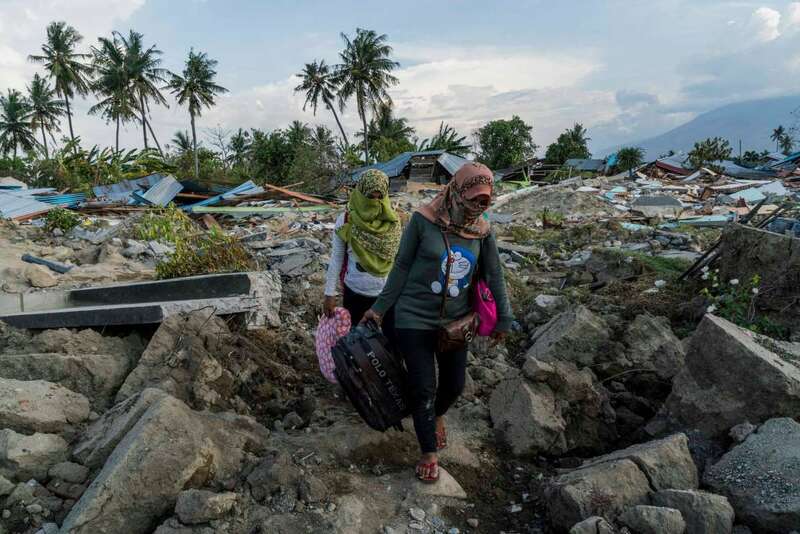 While buildings still stand in some parts of central Palu despite being shaken by the earthquake and slammed by the subsequent tsunami, one neighborhood, Petobo, is a vast sea of twisted debris. Here, the land turned to liquid — as the power of the earthquake turned soil into rolling waves that swallowed houses and buckled roadways — rescuers are sure they will not find anyone alive. They are looking for bodies and have been for days. The Indonesian Red Cross described having to dig through silt as deep as 20 feet in the area. On what were once city streets, a mix of mud and rubble is piled two stories high, with rebar and corrugated metal roofs tilted against crumbling concrete pillars. People try to salvage materials and find their belongings in the devastated neighborhood of Petobo. Occasionally, a building is still distinguishable — a partially damaged mosque or a three-story house, once home to a wealthy family — teetering at a strange angle or poking up from the jagged earth. At dawn, before the recovery work begins for the day, everything is silent and still. But after about 9 a.m. on Thursday, Petobo was transformed into a sea of activity, with hundreds of rescue workers descending on the neighborhood. They worked to clear paths through the area with a bulldozer, and then broke up into smaller groups and used rudimentary tools like pickaxes and shovels, or even just their hands. When they get close to a body — sometimes pointed out by a neighbor or passers-by who smelled decomposing flesh — they have to carefully navigate how to release it from the surrounding debris. These recovery efforts have just begun in some of the most devastated neighborhoods, and some areas are still cut off — indicating that the death toll could still rise significantly. Soldiers on Wednesday watch rescue workers trying to dig out a child's body buried under debris in the Balaroa neighborhood of Palu. At dusk, it is quiet once again as the sun sets and rescue workers are forced to halt their work. Only a few people remain, carefully picking their way over the tangled debris to scavenge for anything usable from the rubble. They walk gingerly across the toppled gates and flattened roofs that provide the only flat surfaces in much of the neighborhood. Some are looking for their own belongings, while others are here to take whatever they can find. In the nearby neighborhood of Balaroa, the scenes were much the same on Wednesday. Rescuers wearing gloves carefully tried to remove the body of a young boy from the soil around him. Nearby, rescuers had found the body of a woman clutching a small child. On Wednesday evening, a teenage girl wearing a hijab carried a broken guitar from the rubble, another woman carried an English grammar book and a group of men hauled away a washing machine. Yet only a few blocks from the vast devastation, houses were intact and cars could maneuver easily through the streets. Adam Dean reported from Palu, Indonesia, and Megan Specia from New York. Hannah Beech and Muktita Suhartono contributed reporting from Palu. A search and rescue team look for bodies under the Roa Roa Hotel on Monday.